When the President of the CIPR wore a cap to school, there were people employed in big organisations called Press Officers. It seemed to me that this is a great time to review the many tasks that now (or will soon) drop on his or her desk. The Press Officer now needs many hats, it would seem. It's budget time. She is looking ahead. A future in which she will identify the nature of the sector (culture) and in which her client operates. Identify the media of most significance to the culture e.g. Newspapers, magazines, radio, TV, digitally enabled channels (from Netflix to Twitter), Internet of Things, Stories and intelligence drawn from Big Data. Develop capability to affect cultures. The extent to which people have withdrawn from reading print media is now well versed. The trend is continuing. The Newspaper Readership Survey shows the total newspaper and magazine readership on and off-line covers most of the population of the UK. +18.5% incremental increase to print readership across magazine brands. By mid-2015, The Guardian, Daily Telegraph and The Independent had a larger online readership than print according to the National Readership Survey. Overall, the readership figures tell a story of traditional print titles not only losing circulation but also losing their relevance online and offline as, for example, women turn to alternative authorities – new blogs, online and tablet brands – for their fashion and lifestyle advice. Ofcom’s Media Use and Attitudes 2015 report, now in its tenth year, shows that internet users aged 16 and above claimed to spend nearly 10 hours (9 hours and 54 minutes) online each week in 2005. By 2014 it had climbed to over 20 hours and 30 minutes. The biggest increase in internet use is cited among 16-24-year-olds, almost tripling from 10 hours and 24 minutes each week in 2005 to 27 hours and 36 minutes by the end of 2014. For traditional PR people, this is an issue. For half a century, PR turned used communication to negotiate with groups of people. It remains a robust if narrow, form of communication and PR as we move towards seeking influence over cultures. The revenues of news channels are disappearing. In the USA, Advertising Age said that measured-media spending fell by 1.8% over the year to June 2015. In July 2015 both the Pew Research Center and the Knight Foundation found that Facebook and Twitter users across all demographics were increasingly using the social networks as news sources. They are however seeking out different types of news content on each platform. There are commercial drivers too. Jon Moeller, chief financial officer at Procter & Gamble, said at an investor conference in 2015: "In general, digital media delivers a higher return on investment than TV or print." In 2015, the UK became the first country in the world where half of all advertising spend went on digital media. Just over £16.2bn will be spent on all forms of advertising in the UK. Digital advertising is expected to grow by 12% in 2015 to £8.1bn to overtake TV and become the largest medium for advertising in 2016. Meanwhile, A fifth (19%) of consumer-facing brands and a quarter (27%) of ad agencies worldwide say mobile advertising is a top priority for their business, yet concerns linger over measurement and privacy. xAd polled 574 ad agency across 11 countries in North America, Western Europe, Asia-Pacific and Latin America. Mobile is a manifestation of the Internet of Things. Our press officer will, of course, now want to master communication using the IoT. The reason advertising revenue has moved from traditional media to digital media is because it is effective. As for advertising, so too for all other forms of cultural influence. As we shall discover, much of what the PR industry thought was creative and skilled has already been usurped by technologies and only awaits mass implementation. This trend in the labour markets has been documented in dozens of studies by economists: Author, Lawrence Katz, Alan Krueger, Frank Levy, Richard Murnane, and Daron Acemoğlu, Tim Bresnahan, Lorin Hitt, and others have documented it. Economists call it skill-biased technical change. By definition, it favours people with more education, training, or experience. This puts pressure on PR now, and it is evident there is a need to look to the future in some detail. An example of the significance of the above trends would suggest that half of all the Press Relations practitioners in 2005 should now be fully trained and equipped digital media experts. Another group of practitioners might be more active with mobile capabilities because eApp stores and tablets helped drive 157% year-on-year growth in 2011, according to an IAB/PricewaterhouseCoopers report. Meanwhile, the nature of traditional channels is changing fast as well. There is a much wider range of communication platform. A survey in the UK by Cision in 2014 showed 54% of journalists who responded couldn't carry out their work without social media (up from 43% in 2013 and 28% in 2012). Fifty-eight percent also say social media has improved their productivity (up from 54% in 2013 and 39% in 2012). If the survey is representative, this means a majority of UK journalists are open to a form of communication that is very different to the traditional press release. It is a change that took less than a decade to emerge. But these developments are but drops in the ocean. There are examples, case studies, if you like, That show how powerful the internet and notably social media, and the application of technologies can be. So far we have seen publications, broadcasters, journalists and some PR practitioners, together with advertising agencies gently move into the digital arena. Meanwhile, the general population is tearing into this new digital environment. Political leaders, like Jeremy Corbyn, can point to successful election campaigns driven by Twitter and Facebook. 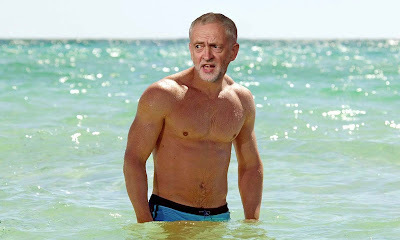 Picture: Jeremy Corbyn as James Bond. Photograph: @sexyjezzacorbyn. The dynamism of the Corbyn social media presence is described by Stuart Heritage in the Guardian In which he describes the elements that add up to internet gold. At one point, the hashtag #JezWeCan was being used once every 25 seconds on Twitter. Over on Facebook, a tentative Jeremy Corbyn victory party was being planned for the evening of 12 September in Trafalgar Square, London. Many, many personalities, not to mention brands would like to replicate such a movement. There are other indicators of behavioural change showing a need for attention to the significance of online, including mobile, effects on people. The British Retail Consortium (BRC), and data consultants Springboard, reported high street footfall was down -2.8% in June 2015 compared with the same period in 2014. Shopping centres also suffered, seeing a decline of -2.4% year-on-year. Out-of-town retail parks fared reasonably well, Retail Bulletin reported. They are attracting more "click and collect" shoppers and reported a +2.8% rise in footfall, the 18th successive month in which the sector's footfall has increased. Meanwhile click and deliver services are booming. There are behavioral changes to take into account too.